Chances are that, languishing in your basement or garage, you have an old wooden ladder splattered with coats of paint and worn from years of use. If not, old ladders can usually be found for a fair price in antique and vintage stores. 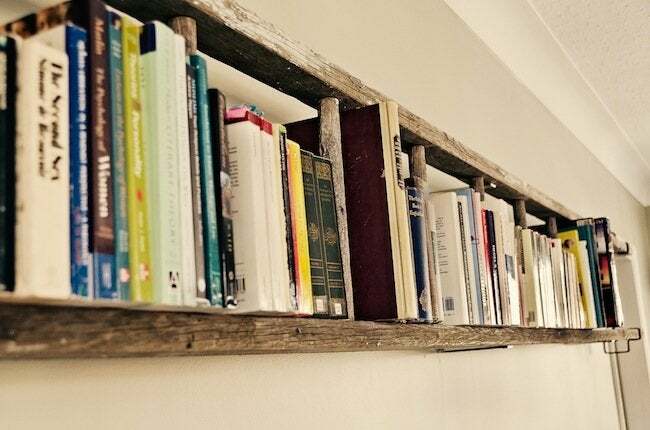 Repurposed, they are a great way to bring character into a modern interior. What exactly can you do with a dilapidated ladder? We’ve got five ideas on how to transform your time-worn climber into something useful again. 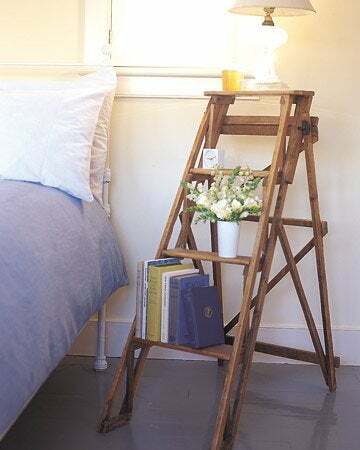 The small stature of a step ladder makes it an ideal nightstand, no alterations required. The steps provide multiple levels, so a reading lamp, books, beverage and even flowers can share the real estate. Spied on Vintage With a Twist. 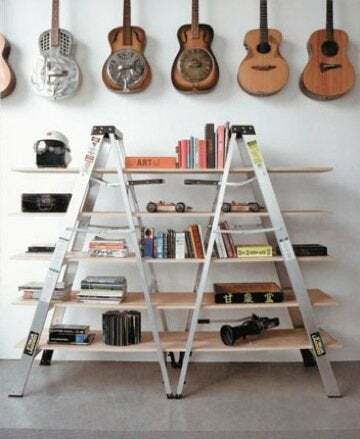 Avid DIYers can try this ladder-as-pot-rack project. Head to your local hardware store for four lengths of sturdy chain, four screw hooks and toggle bolts, and long S-hooks. Attach the screw hooks to one side of the ladder, loop the chains onto the hooks, and attach the chains’ other ends to the ceiling-mounted toggle bolts. Be sure to locate the ceiling joists when installing the toggle bolts for secure installation. 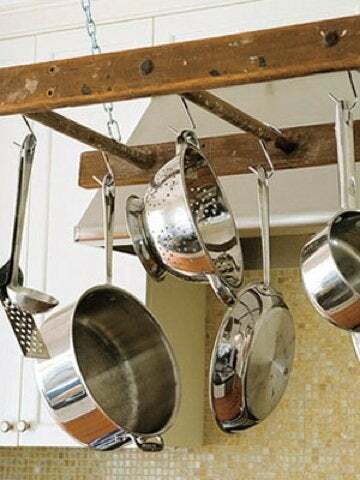 Finally, use the S-hooks to hang your pots and pans. For full instructions, visit Woman’s Day. Two ladders and some plywood create a wide shelving unit perfect for housing books and decorative objects. Since finding two vintage ladders of the same dimensions can be tough, consider buying matching new ladders to achieve the look. Courtesy of Furious Shirley. Utilize the rungs on both sides of a folding ladder and attach plywood shelves; the result is a great spot to display your treasures. Paint the shelves with a durable semi-gloss finish for a nice contrast with the weathered wood. West Elm shows how to use vertical space in a bathroom wisely. This leaning ladder easily becomes a multi-tiered towel rack. 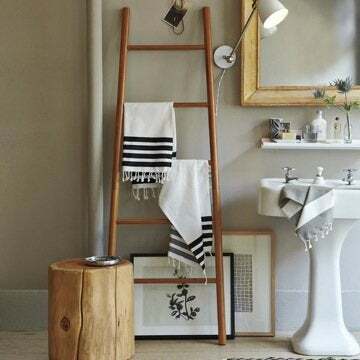 A typical ladder takes up about the same width as the average towel bar but allows for more towels to be stored simultaneously. 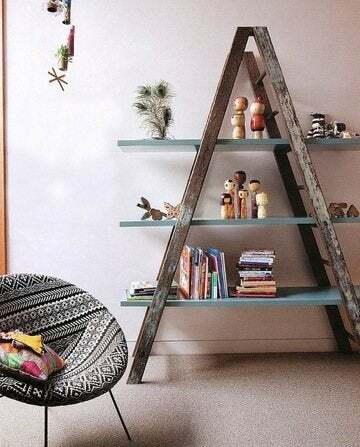 Another simple use for old ladders seems downright obvious yet helps clear the clutter from your coffee table. Cory Connor Designs suggests leaning a ladder against the wall, then draping magazine issues or newspapers on the rungs.